Klyuchevskoy, a glacier-covered volcano on the Kamchatka Peninsula in eastern Russia, is erupting. 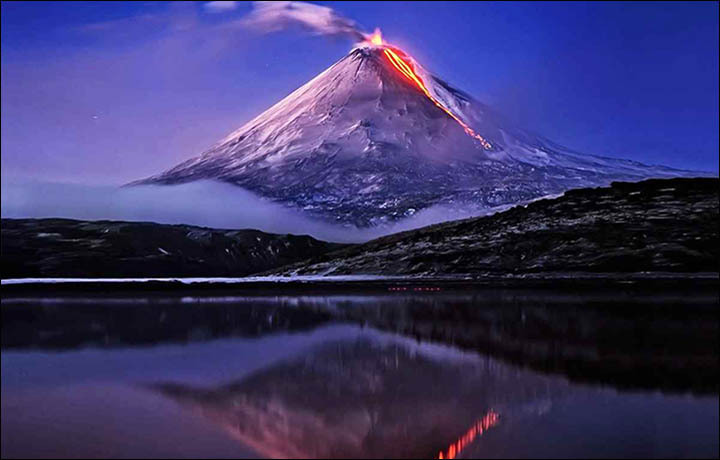 The volcano, 4,750 meters (2.95 miles) in elevation, has had a history of extensive activity over the last 7,000 years. It has been emitting gas, ash and lava since April 3, 2016. Several organizations are closely monitoring its eruption. They note that ash explosions reaching 6 to 8 kilometers (19,700 - 26,240 feet) in height could occur at any time, affecting flights from Asia to Europe and North America. Local impacts could also be extensive. Explosive-effusive eruption of the volcano continues. According to video data, gas-steam plume containing ash rose up to 5.5 km a.s.l. at 23:03 UTC on July 10. Satellite data shows a weak ash plume drifted for about 170 km to the east-northeast from the volcano at 0200 UTC on July 11. Ash explosions up to 19,700-26,240 ft (6-8 km) a.s.l. could occur at any time.